It's extremely difficult to follow a big hit, which is why they never tried to turn Saved by the Bell into a college sequel featuring Bob Golic as a dorm advis...wait, what? They did? And Kelly sleeps with an anthropology professor?? 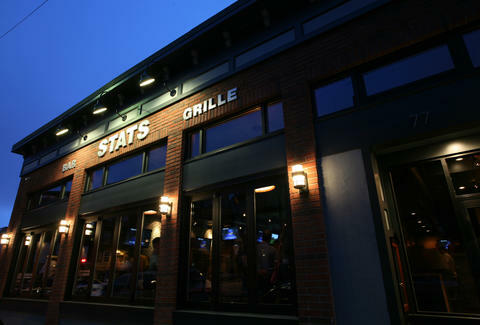 Following their big hit in Southie instead of California University, Stats Bar and Grille, soft opening tonight. 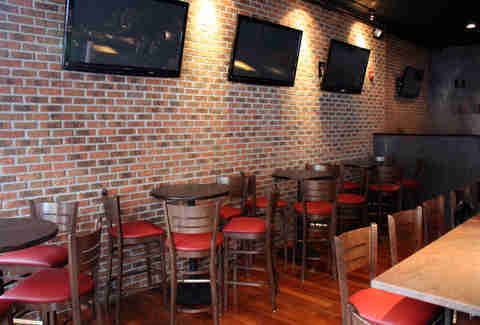 The long-awaited followup from the dudes behind perennial downtown favorite JA Stats, SB&G has taken over the former South Kitchen and Wine Bar space and turned it into a comfort foodery/pub much more in tune with Southie's casual vibe, featuring 21 flatscreens, exposed brick walls, hardwood floors, and a U-shaped chocolate granite bar, giving it a subtle industrial vibe, like Don Draper if he were constructed out of i-beams, but subtle i-beams. Grub starts with apps like Buffalo Calamari (with baby spinach/bleu cheese), Tempura Artichoke Hearts stuffed with goat cheese in a sundried tomato vinaigrette, and their famed Chicken Tenders (with housemade sweet 'n sour), whose recipe was passed down from their grandfathers restaurant in NH, where the motto is Live Free (Range) or Die! More substantial fare ranges from burgers (Cali style with Swiss, avocado, smoked bacon; Jalapeno with hot cherry peppers, buffalo cheddar, and chiptole) to paninis (the Cuban w/ pulled pork, smoked ham, grain mustard, and Swiss) to burly entrees like Braised Short Ribs in red wine sauce, and Grilled Caribbean Shrimp Kebobs with a salsa of pineapple and mango, though admittedly mango's tight shorts and spangled beret kind of make it hard to concentrate on the pineapple. Beerwise, they've got 12 standards on tap (plus Woodchuck), as well as 28 bottles (Toohey's, Wachusett Blueberry, Pete's Wicked Ale) and can specials; they're also serving a late night menu 'til midnight and brunch on the weekends featuring grub like steak & eggs and a three egg/bacon/homefry dish called the Big 3, also the name NBC execs gave to Zach, Slater, and Kelly, once they realized there could never be a Saved By the Bell without them...wait, really? The "New Years"? Screech still has nothing else going on?